Be the first to share your favorite memory, photo or story of Allen . This memorial page is dedicated for family, friends and future generations to celebrate the life of their loved one. 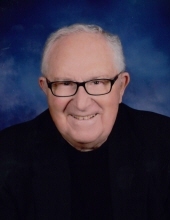 Allen A. Kreuscher, 88, of Beatrice passed away Saturday, February 9, 2019, at St. Elizabeth Hospital in Lincoln. He was born on August 25, 1930, at rural DeWitt, graduated from DeWitt High School in 1947, and attended the University of Nebraska for one year. He served in the Nebraska National Guard for six years. He married Mary Ann Spilker on June 27, 1954, at St. Paul’s Lutheran Church of rural DeWitt and they lived and farmed in the DeWitt area until moving to Beatrice in 2005. He worked at Fox Funeral Home for five years. He was a member of Christ Community Church of Beatrice where he had served on the church council and was the head usher. He was a member of several organizations including Board of Pregnancy Resource Center, Beatrice Kiwanis Club, founding member of DeWitt Grange – and was First Master, Nebraska Ag Council – receiving the Ag Achievement Award, Past President of Nebraska Corn Growers, member of the National Corn Growers Board, Nebraska Ethanol Board, State ASCS Committee and County ASCS Committee. He enjoyed going antiquing with Mary Ann. Survivors include his loving wife of 64 years, Mary Ann of Beatrice; one son, John (Kristi) Kreuscher of Gothenburg; one daughter, Jane (Tony) Gevo of Largo, FL; two grandsons, Aaron and Andrew Kreuscher of Gothenburg; one sister, Lois Schuerman of Lincoln; several nieces and nephews and many close friends. He was preceded in death by his parents, William and Grace (Felderman) Kreuscher; brother, Glenn Kreuscher and wife Marion; sister, Ruth Powell and husband Tom. Funeral services will be held at 10:00 A.M. on Friday, February 15, 2019 at Christ Community Church of Beatrice with Pastor Jack Magness officiating. Inurnment of the cremains will be at the Oak Grove Cemetery of DeWitt at 4:00 P.M. on Friday. The body will lie in state at the Fox Funeral Home of Beatrice on Thursday, 12:00 noon until 8:00 P.M. with the family greeting friends from 6:00 P.M. until 7:30 P.M. Visitation will continue at the church one hour preceding the service on Friday. In lieu of flowers, a memorial has been established to Christ Community Church. www.foxfuneralhome.net Fox Funeral Home of Beatrice is in charge of the arrangements. To send flowers or a remembrance gift to the family of Allen A Kreuscher, please visit our Tribute Store. "Email Address" would like to share the life celebration of Allen A Kreuscher. Click on the "link" to go to share a favorite memory or leave a condolence message for the family.